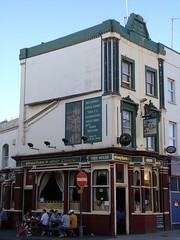 Small locals' Irish pub on Goldhawk Road in Shepherd's Bush. Inside, it's a single small room with the bar in the centre, and banquette seating around the walls flanked by eight or so tables. There are four or five picnic benches outside. bob visited on a Friday afternoon in May 2009. No handpumps were in evidence, so I had a pint of Guinness (£3) instead; it was fine. Other options included Boddingtons, Tetley Smoothflow, Strongbow, Carling, Stella, and the other usual suspects. A largescreen TV at the back was playing a music channel, and another at the front was showing horse racing with the sound up (in fact they turned the sound down on the music one whenever there was actually a race on). Betting slips were laid out on the bar, and the other customers were popping in and out to make bets at the bookies around the corner. Accessibility: No steps to get in. Toilets not checked. Last visited by bob, 29 May 2009. Opening hours taken from board outside, May 2009. Last edited 2011-06-26 14:38:25 (version 2; diff). List all versions. Page last edited 2011-06-26 14:38:25 (version 2).